Wysong natural food products and supplements are for improving your pet’s health and vitality. Since, 1979 it is producing several varieties of pet foods, treats, and supplements. Its dog food product line consists of numerous dry, raw, canned and dog supplement products. It manufactures and formulates all its products in its in-house facilities by an internal team of pet doctorate professionals. The scientifically proven dog supplements are designed to help recover the essential food components eradicated during conventional pet food processing. Wysong Call of the Wild Dog supplement is prepared to balance a fresh meat diet. Its features, ingredients and feeding directions are part of this content. Firstly, we will look at the purpose of Call of the Wild. The best food to feed canine companion animals is the food they are genetically adapted to such as the raw, natural, typical carnivorous diet. These foods include not only muscle meat, but also organs, bones, and vegetation filled viscera. For feeding your pet with these things in combination with home prepared meals that consists of primary meats, Call of the Wild supplies needed minerals and micronutrients to help balance these found in natural prey. The modern conventional dog foods processing generally eliminates essential nutrition and Wysong dog supplements like Call of the Wild help restore energy. Balance Fresh meat – Call of the Wild is designed to balance a fresh meat diet or Wysong Starch Free Au Jus or Epigen (all meat) canned diets. Ingredient In natural Proportions – Call of the Wild dog supplement helps achieve typical feeding patterns by supplying organ meat, fats, connective tissue, herbs, minerals, vitamins, proteoglycans, enzymes, probiotics, and many other micronutrients in the levels and proportions available in natural prey. Proteoglycans – This is a complex biochemical which is essential to the connective tissue structure of the body. Proper production of this element requires correct nutrition offered by Call of the Wild, without which, joints, in particular, can suffer. Complete pet diet – This is a perfect pet diet truly meant to mimic the natural feeding practice. This requires consuming nearly all aspects of wild prey, and not just the muscle meat. By including call of the Wild vitamin to fresh meat or other Wysong all meat varieties, you can give your pet all meat meals in an entirely and naturally balanced form. Turns Nutritional Power – Call of the Wild supplements will convert your usual canned dog food into genetically proper meals which are fully packed to offer natural, nutritious power. Uses – This supplement is useful with all canned products as similarly it contains more amount of moisture. Effectively Optimizes Health – This dog supplement provides living food elements such as organs, muscles, bones, etc. offering a complete spectrum of natural nutrients to optimize health effectively. Available Packaging – Call of the Wild is available in bottle or pail formats. 11 oz. Bottle and 5 lb. The pail is available packs to buy. Call of the Wild supplement contains essential ingredients such as: Chicken, Chicken Liver, Lecithin, Kelp, Calcium Carbonate, Plums, Ground Bone, Dried Seaweed Meal, Calcium Lactate Pentahydrate, Barley Grass Powder, Coral Calcium, Wheat Grass Powder, Organic Blueberries, Taurine, Carrots, Enterococcus faecium, Lactobacillus Plantarum, Direct-Fed Microorganisms (Bacillus subtilis, Lactococcus lactis, Lactobacillus casei, Lactobacillus lactis, Aspergillus oryzae, Yeast Culture, Aspergillus niger), DL-Methionine, L-Arginine, L-Carnitine, Phytase, Rosemary Extract, Sage Extract, Choline Chloride, Vitamin A, Vitamin C, Vitamin D3, Niacin, Thiamin, Iron, Zinc, Manganese, Calcium Pantothenate, Pyridoxine, Riboflavin, Folic Acid, Copper, Menadione, Selenium, Iodine, Biotin and Vitamin B12. Its Minimum Crude Protein content is 10%, Taurine is 4%, and Crude Fat is 1%, and the maximum Crude Fiber content is 2%, and Moisture is 11%. Adult Dogs and older puppies – 1 teaspoon (3-4 shakes) per 3 oz (about 1/3 cup) of fresh meat or regular pet food meal. It is advisable to not use vitamin or mineral supplements along with Call of the Wild. After opening the bottle or pail keep it tightly closed. Store the opened bottle in temperate conditions. For long-lasting freshness and preservation freeze or refrigerate Call of the Wild. 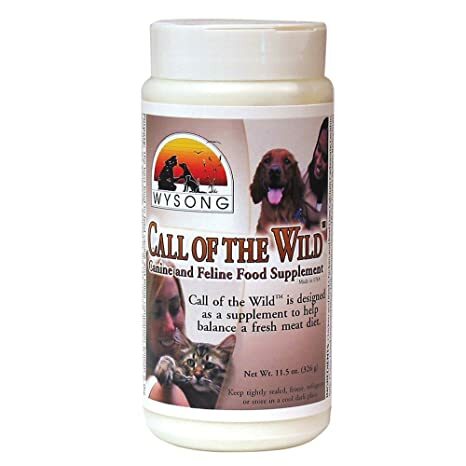 Wysong Call of the wild dog food supplements is a perfect mix of organ meat, fats, connective tissue proteoglycans, minerals, vitamins, enzymes that help your pets overcome feeding disorders. Here are few calls of the wild supplements reviews for your reference. Do have a look.